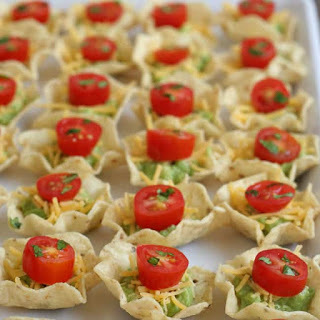 Cook's Notes: A healthy light perfect party snack or an easy lunch idea. You can add variety here by switching out the type of cheese, using ham instead of turkey, vegetarian by adding in more veggies and by using a different flavor wrap. Recipe from dinneratthezoo.com and one wrap makes 10 pinwheels. Directions:Lay your tortillas flat. Spread 1/4 avocado dip on each tortilla. Layer with cheese, spinach, turkey and bacon bits if using. Roll the tortilla lengthwise tightly. Cover with plastic wrap and refrigerate 1-2 hours. Use a serrated knife and cut crosswise into 10 pieces to serve. Combine the softened cream cheese, yogurt, salsa and taco seasoning. Beat until smooth. Spread out on a plate and refrigerate 1 hour. Top with remaining ingredients, serve with chips, add festive napkins and your party is ready to rock. Cook's Notes: Tostitos Scoops (Chips) are labeled gluten-free and included on Frito Lay’s gluten-free list. Keep in mind that there’s always a number of broken ones in the bag, so if you want a full tray to bring to a party, pick up two bags so you’ll have enough intact scoop chips to use. Also, add guacamole right before serving so chips don't get soggy. A timesaver- using store bought guacamole that is gluten-free. Just be sure your guacamole store bought or homemade has a good amount of lemon or lime juice so that it doesn’t turn an unappealing brown color as it sits out at the party. Cherry or grape tomatoes are perfect to give you firm, small slices for these. Cilantro – a little goes a long way for flavor! Arrange Scoops in single rows on a serving tray. Fill each with a tablespoon of guacamole. Sprinkle with cheese and top with a tomato piece.